This recipe for basic Polish pierogi dough is a simple combination of flour, eggs, water, and salt. You might need to add a little more water or a little more flour based on the humidity of the day, the weight of the flour, etc. The dough should not be crumbly, nor should it be sticky. Get the kids involved in this easy project by breaking it down into steps—make the dough one day, roll and fill another day, and cook yet another day. Filling and sealing the dumplings take a little practice, but small hands can certainly mix, roll and cut the dough. The younger you start them on their pierogi-making journey, the more adept they'll be at making them by the time they develop voracious teenage appetites. In a medium bowl, whisk together eggs, salt, and water. Add the flour all at once and mix until well moistened. Then knead the dough in the bowl until it is firm and well mixed. Cover with an overturned bowl or loosely with plastic wrap and let rest 10 minutes to 1 hour for the gluten you've developed in the mixing process to relax. This will make rolling much easier. Or you can wrap the dough in plastic, refrigerate it, and work with it another day. Make sure you let it come to room temperature before you start to roll it. If using the dough immediately, divide it in half, wrap the other half in plastic and set it aside. The next steps are to roll, cut, fill, and cook the pierogi. Polish dumplings can be filled with sweet or savory ingredients. 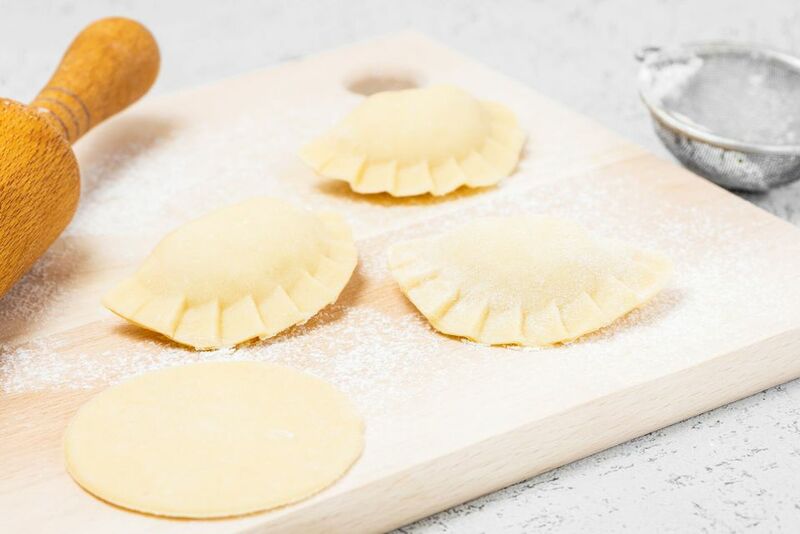 Traditional fillings include minced cooked meat, sauerkraut with mushrooms, seasonal fruits like blueberries and strawberries, buckwheat or millet, savory or sweet curd cheese, and potato-onion-cheese known as pierogi ruskie. There's really no right or wrong on how you choose to fill your pierogi. These days, at the Kraków (Poland) Pierogi Festival held yearly in August, you'll see nontraditional things being stuffed into tender pockets of dough—everything from spinach to seafood and gourmet cheeses. As for how to serve them, sweet pierogi benefit from a sprinkle of confectioners' sugar and savory pierogi wouldn't be the same without sour cream and bacon bits or pork cracklings known as skwarki.